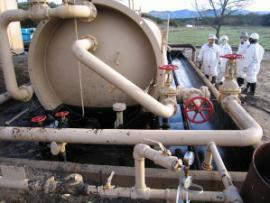 On January 5, 2008, an oil spill occurred in the Davis Tank Battery on the Greka Energy Zaca Lease. The spill report stated that 20 barrels of crude oil and 50 barrels of produce water were spilled. The spill was the result of the over filling of a produce waste water tank. The tank overflowed for approximately 13 hours before being discovered. 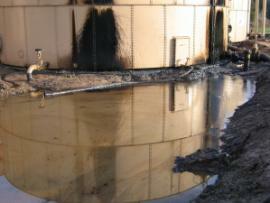 The oil and produce water spilled into the secondary containment of the Davis Tank Battery. The containment of the tank battery was comprimised by an unvalved 12" diameter drainage conduit that allowed the spilled material to exit the secondary containment. 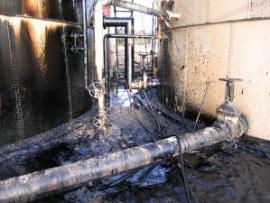 The oil and produce water exited the secondary containment and migrated through a Santa Barbara Co. Roads Yard, through a winery equipment storage yard and finally into an unnammed tributary to Zaca Creek. The oil initially traveled approximately 1/2 mile down the creek. The Santa Barbara Co. Fire Department and the California Department of Fish and Game (DFG) responded to the spill. The DFG directed Greka to retain a contractor to cleanup the creek. Greka retained Advanced Cleanup Technologies (ACTI). Due to rainy conditions, Greka built to dams to prevent the oil from migrating futher down the creek. On Saturday night, due to flash flood conditions in the creek bed, the dams were compromised and the oil flowed approximately another 3/4 mile downstream. The initial spill report came into the Region 9 duty officer on Saturday morning. The On-Scene Coordinator (OSC) Duty Officer contacted OSC Robert Wise and notified him of the spill. OSC Wise was also notified of the spill by Santa Barbara Co. Petroleum Office and the DFG. OSC Wise promptly dispatched a START contractor from the Santa Maria, California START office to conduct a site visit and assess the situation. 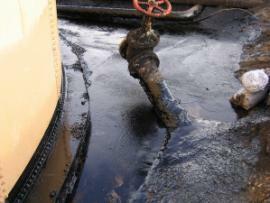 START stated that a large area of coated in oil and that the dams placed in the creek had been compromised. START also stated that the estimate of the amount of oil and produce water spilled exceed the initial spill report. Based on this information and in consultation with the Duty OSC, OSC Wise mobilized to the spill on Sunday morning. OSC Wise also mobilized two additional START team members, the Pacific Strike Team and the Southern California EPA Mobile Command Post. OSC Wise and START arrived on-site late on January 6, 2007. After meeting with the START on scene, OSC Wise assessed the situation in cooperation with START and the ACTI Response Manager. On January 7, 2007, OSC Wise, START and PST mobilized to the site. OSC Wise met with DFG representatives and formulated activities for the day. At EPA's direction, Greka directed their contractor to work on removing the sources of migrating oil in the County Road Yard and the winery storage area. Greka's employees were cleaning up the Davis Tank Battery and the County Road Yard. ACTI further repaired the dams in the creek and worked on removing the oil and the creek. On February 11, 2008, the cleanup in the creek was completed. 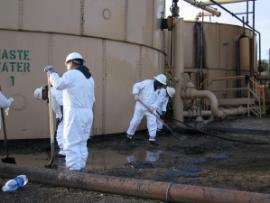 Greka is currently conducting restoration activities on the private property affected by the spill and in the creek. As of February 18, 2008, DFG is estimating the total spill amount including produce water to be 194,172 gallons. 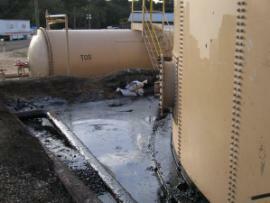 The amount of oil spilled was approximately 50,400 gallons.